The Faria property along Ojai Avenue is now the location of Cluff Vista Park. The Faria family patriarch, Manuel del Terra Faria, was a Portuguese immigrant from the Azores. The family built their home in Ojai during the 1920s. There was a main house and guest house at the back of the property along Rincon Street. Mrs. Faria couldn’t stand the summer heat in Ojai, so the family moved to a beach house at what is now Faria Beach. They rented their Ojai property to the Erburu family who lived there for many years. Lawrence Erburu, a son, was killed in WWII and is memorialized on the WWII memorial next to the east pergola arch. The other son, Robert, is a retired businessman who once served as President of the Times-Mirror Corporation. Today, it is Cluff-Vista Park, Ojai’s newest park. Thanks to David Mason for the photo and information. Nice historical work, Craig! 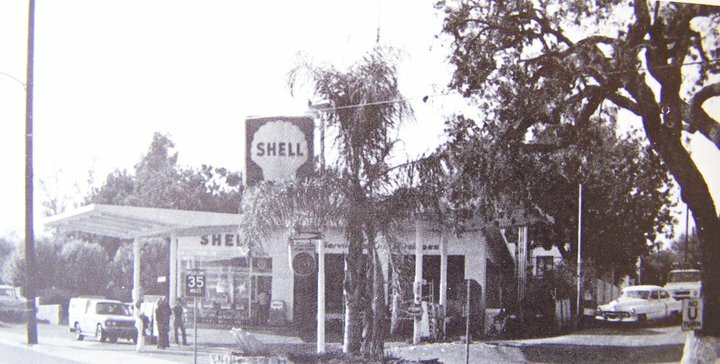 I never knew the history of the land prior to Adamson Shell – I suppose I just thought it was always a Shell station. 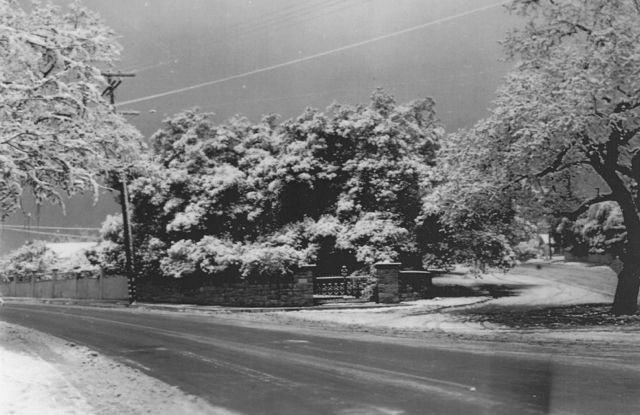 I appreciate the snow shot too – a rarity for Ojai surface streets. And, I think that same Oak Tree still lives and grows at the lower end. I will have to pay attention next time I drive by. The snow, what a treat! Good story to share.